Training your canine companion can be both an extremely rewarding experience and a frustrating one. Training a dog involves curtailing some of their natural instincts such as barking, running around, and jumping. How you decide to train your dog depends on any number of factors: your dog’s breed and temperament, your own experience with training, and the behaviors you’re trying to teach or prevent. There exist a large number of training aids available for dog owners to use including shock collars, electric fences, clickers, and other devices designed to help owners effectively train their pooches. In this article, we look at the ins and outs of shock collars. Shock collars are usually meant as a deterrent against negative behavior including barking and remaining in your yard. The PetSafe dog training collar is one of the highest rated shock collars on the market. With a range of 400 yards, the Yard & Park rechargeable collar works well both indoors and outdoors. It’s great if you are planning to take your dog hiking or if you’re simply keeping him in the backyard. 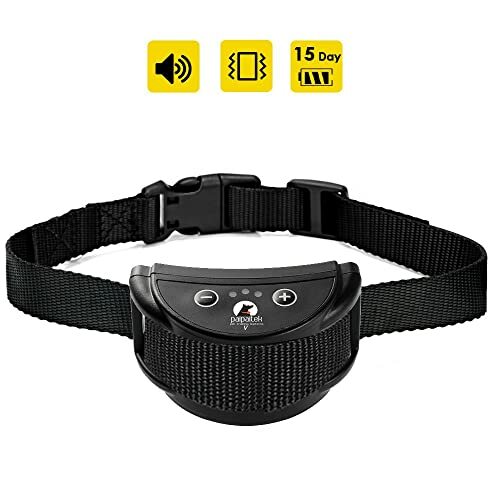 With 8 adjustable levels and both static stimulation and two tones level, this collar offers flexibility to not only teach your dog commands but to also correct undesirable behavior. Some other features make this a great purchase. For instance, the collar and remote both come with rechargeable batteries instead of replaceable. There’s less need for you to constantly buy new batteries! The collar is also waterproof, ensuring that your aquatic-loving dog won’t get shocked due to moisture. Lastly, the collar fits dogs over 8 lbs. It works for almost any type of dog! Some have said the battery does not last as long as advertised. It has also been noted that the battery takes a long time to recharge compared to other options. The collar is made of plastic which may not be to the liking of some dog owners who prefer a more comfortable collar for their dogs. If you’re looking for a collar that specifically addresses barking behavior, you’ll want to look at the Bark Collar from Demeao. This adjustable nylon collar comfortably sits on your dog’s neck and won’t rub or chafe if fitted properly. 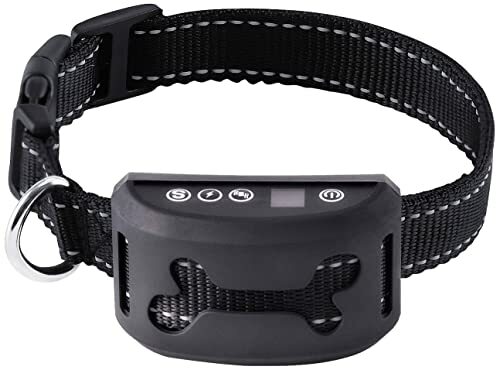 This collar features a 7-grade adjustable sensitivity in addition to three training modes for your dog including Beep, Vibration, and Shock. Select a grade and a mode for your dog, and you can go from there! The Demeao collar also employs vibration triggering technology instead of sound to activate the collar. The collar reacts to your dog’s barking and will not be set off by the barking of other dogs. Two additional highlights are the collar’s waterproof nature and the rechargeable battery. The built-in USB battery lasts for approximately 14-20 days on one 1-hour charge. The collar has been known to trigger with no provocation. There’s also a chance your dog won’t respond to the collar. If that’s the case, you may need to find something that offers other types of modes. Not all shock collars are created equal. Some work for smaller dogs, some work for larger ones. If your dog falls on the larger end of the spectrum, you’ll want to look at this collar from Banne. Many entries in this list work for dogs with necks up to 22 inches. This one works for dogs with necks up to 25 inches. This particular collar is triggered by sound. Once it detects your dog’s barking, it will trigger the correction process through a series of vibrations or sounds. This makes it more humane and effective than other shock collars on the market. 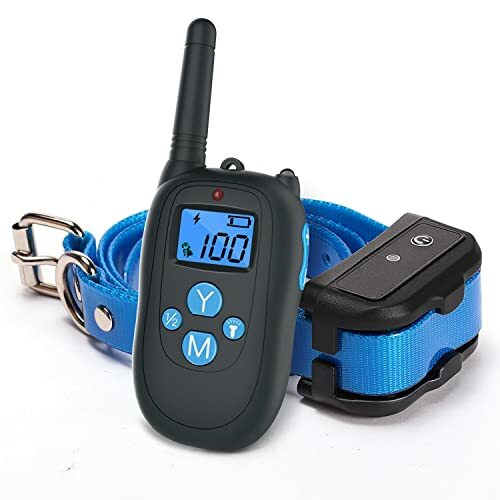 The nylon collar adjusts to fit a wide variety of dog breeds, and it also comes with easy-to-use buttons to adjust the sensitivity for the most suitable level of correction. If you’re concerned about if this collar will work for your dog, the manufacturer offers a one-year warranty. This is a relatively inexpensive collar so keep in mind that it might not be as durable as some other heavy-duty ones. Additionally, some of these collars have stopped working after a few months. The PetTech PT0Z1 Premium Dog Training Shock collar is easily one of the strongest entries in this list. It works at a range of up to 1200 feet. It’s perfect if you have a large yard or if you’re taking your dog with you if you camp or hike! This collar comes with a remote that has a huge LCD screen with an easy-to-read display. The blue backlit display works well in both day and night settings. The lithium ion battery charges quite quickly and lasts for a long time. It also offers an auto-power mode to conserve power when not in use. With 100 levels of customization, you’re able to adjust the static, vibration, or beep modes to a highly precise level of control. As with all collars, it may not work with all dogs. Some dogs ignore the shock or the other corrective methods. Also, the range may not extend to 1200 feet as the manufacturer indicates. Some shock collars may have a lot of buttons that can be confusing. 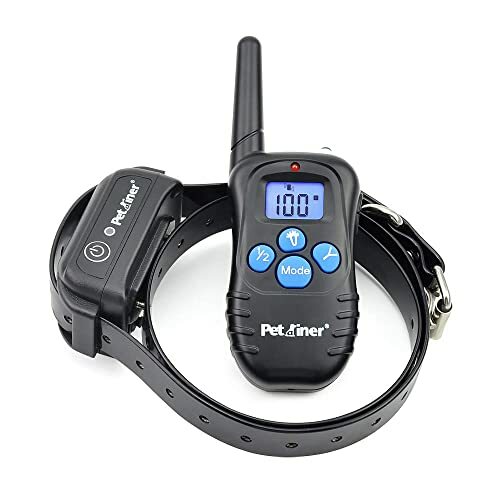 With the ipets PET619S collar, you don’t need to worry about a confusing interface. The remote has just a few buttons for sound, shock, and vibration settings and a dial to adjust the intensity. This collar is waterproof; if your dog loves to play in the rain or sprinklers, you can still safely use it to train your dog! The ipets PET619S collar works for a range of up to 220 yards, making it great for home or outside use. Both the remote and the collar come fitted with a rechargeable battery, and you can charge both at the same time. Larger objects might cause some interference with the remote and the collar, however. It’s important to use this product, if possible, in a clear area with little to no interference. 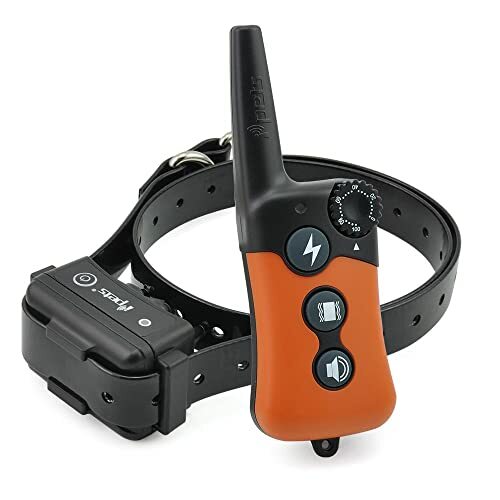 This Petrainer shock collar was designed for both dogs and dog owners in mind! If you’re new to dog training, you’ll want to look into this collar. With over 100 levels of static shock and vibration settings, you’ll have no trouble finding the appropriate settings for your dog. 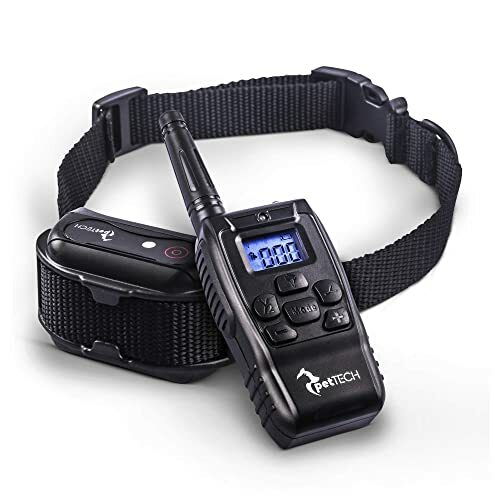 Unlike some other entries in this list, the Petrainer waterproof dog shock collar packs in a power-saving design with automatic standby and a memory function. This collar is extremely easy to use. The remote contains just a few buttons you can use to easily change training modes. It also fits easily into one hand and weighs next to nothing! One issue is that there’s no lock function on the buttons. This makes it simple to accidentally trigger any of the corrective buttons and shock your dog. The Nemobub shock collar is one of the best value shock collars out there. It offers a wide range of features at a reasonable price. The Nemobub collar comes with three training modes: static stimulation, beeps, and vibration. 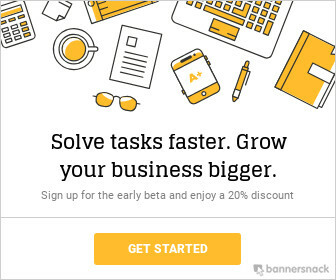 Each mode offers a large number of levels for optimized customization of your training plan. The remote uses three colors to differentiate between the modes. The remote is quite comfortable to hold. The rubberized grip feels soft and solid in your hands. You don’t need to worry about accidentally dropping it! With a range of up to 330 yards, you’ll definitely be able to keep control of your dog in almost any location whether it’s the park or your backyard! The manufacturer does not recommend this product for dogs who show signs of aggression. If you’re looking for a collar to perform that function, you might want to consider searching for a different product. If comfort is a key requirement for you, you’ll love the Altman dog shock collar. Comfort is built right into the collar and the remote. The collar is made of durable, soft nylon. The remote is covered in a silicone gel surface for extra comfort and grip. The Altman collar fits dogs weighing between 10 lbs and 110 lbs so you can use it with almost any dog! It also fits neck sizes ranging from 7 to 26 inches. Like other entries in this list, the Altman collar offers three training modes: vibration, beep, and static shock. It also offers 100 levels of customization and is waterproof. Although nylon is comfortable, some dogs may not like when the collar gets wet and the nylon weighs down, especially smaller dogs. Once you purchase a shock collar, you might be anxious to use it right away! 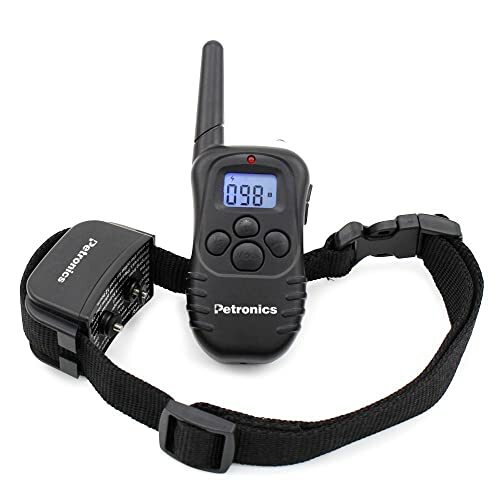 The Petronics shock training collar only requires 10 seconds to synchronize the transmitter to the collar. Then you can start training your dog! As with most collars, the Petronics collar fits most dogs from puppies to large adults. It extends for a range of up to 330 yards. Perhaps the most compelling feature is the four training modes: beep, light, vibration, and static shock. This is one more training mode than most other collars. It also includes a light mode to help you see your dog in low-light conditions. The collar is water-resistant, comes with rechargeable batteries, and includes a power-saving design to increase battery life. It has been said this collar does not last very long. If that’s the case with you, you might need to purchase a new one if you’re not able to train your dog right away. Some have also noted that the shock does not always work as strongly as they would like. 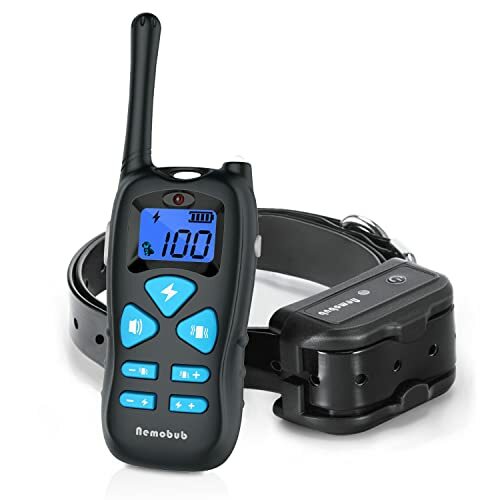 If your smaller dogs misbehave or if their barks would scare the bravest postman, look no further than the eXuby shock collar for small dogs. The packaging for this product contains two collars: one small and one medium, perfect if you have dogs around that size or if you’re not sure which collar will work best for your dog. This collar also includes a clicker that you can use in conjunction with your collar. Use the clicker prior to using the shock or other training modes. 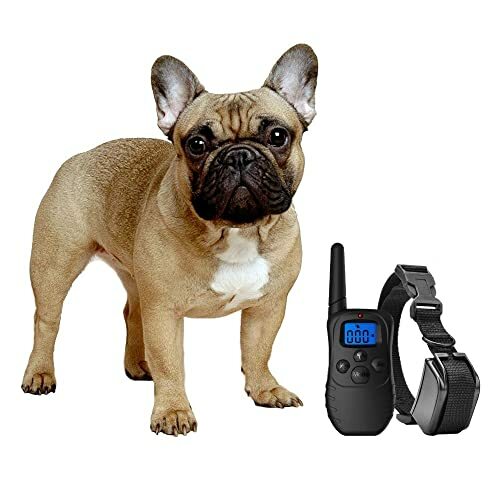 Your dog will learn to associate the clicker with the following shock and should hopefully come to stop barking or undesirable behavior after the click. With three training modes, you’re able to adjust your training plan to best suit your needs! This collar works well to correct behavior such as barking, jumping, digging, and other behaviors you might find annoying or destructive. Turn your bad boy into a good boy! First and foremost, note that these collars are meant for small- to medium-sized dogs, not large ones. You’ll want to look at other shock collars meant for large dogs. The collar battery is known to not last the longest as well. It charges quickly, but it doesn’t last more than a few hours at a time. A shock collar uses small electric pulses to correct your dog’s behavior or address a concern. If used properly, a shock collar forms an effective, safe mechanism to train your dog to exhibit correct behavior or to prevent undesirable behavior. Most shock collars consist of two parts: a collar and a remote used to monitor and correct from a distance. Shock collars usually employ a few types of training modes: vibrations, beeps, and shocks. These days, the shock function is usually recommended only in emergency situations. Multi-purpose devices offer you increased flexibility in your training plan. Shock collars offer both benefits and drawbacks. Perhaps the most notable benefit is that they, if used properly, are a relatively safe and easy way to correct and prevent undesirable behavior such as jumping, barking, digging, chasing, or other behaviors. Shock collars also use a variety of modes to train dogs. Most have at least two or three methods of correction including vibration, static shock, and beeping. Some others might include light as another mode. A variety of training modes means that you can customize the type and intensity of your training to align with your dog’s behavior. Shock collars are also, for the most part, cheaper than relying on a professional dog trainer to accomplish some of the same goals. You can find shock collars priced fairly reasonably and can be a cheaper alternative than other training methods. Shock collars come with a couple of drawbacks, however. Firstly, shock collars have the potential to hurt a dog if used at too high of a level. 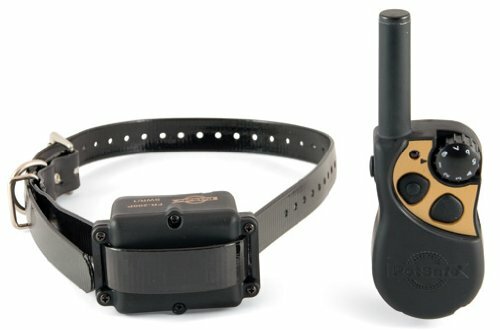 As a general rule, the shock setting on a shock collar should only be used in an emergency. Most recommend using a lighter training mode such as vibration to start. The shock setting on a collar has the potential to hurt your dog by causing inflammation or injury to your dog’s tissue. The vibration and beeping settings only startle your dog and are a safer option. Secondly, shock collars do not offer a positive reinforcement mechanism to reward your dog for correct behavior. Positively reinforcing and incentivizing your dog with praise and treats becomes extremely important. In general, shock collars should be used as a last resort when addressing consistent undesirable or dangerous behavior. Although they tend to be cheaper than professional dog trainers, it may not hurt to look into them if you’re looking for a safer way to correct your dog’s behavior. Shock collars can be defined by the functions they serve. The first type of shock collars is anti-bark collars. Anti-bark collars do exactly as their name suggests. They are used to control a dog’s barking. These collars are usually triggered either by the sound of a dog’s bark or by the vibration a dog’s throat makes before they bark. The second type of shock collars is a simple training collar. Dog owners use these to modify behavior they don’t like to see in their dogs or to encourage acceptable behavior. For instance, these can be used to prevent jumping or to crate-train a dog. Lastly, there are shock collars used alongside invisible or wireless fences. Wireless fences keep dogs contained within a certain range or to keep them out of a certain area. The collars emit an electrical signal that lets a dog know when they’re close to going past the fence boundary. Since shock collars come in different types, you should align your objective with the type of collar you need to buy. You wouldn’t want to purchase an anti-barking collar if you wanted to keep your dog inside a wireless fence, right? Failing to keep this in mind might mean you accidentally hurt your dog or correct behavior that might actually be non-destructive or acceptable. That will send the wrong signal and could mean your dog is trained incorrectly. All in all, it doesn’t matter how much you spend on a shock collar if you’re worried about a “safer” shock for your dog. Most shock collars have similar features so you should be able to find a good shock collar without having to break the bank. Know the measurement of your dog’s neck. Not all shock collars are created equal, and if you don’t find the right size collar for your dog, there’s a chance the collar could be too small or too large for your pup. If this is the case, your canine companion will not react to the collar as they should. Or, it will be too uncomfortable for them to wear. Fortunately, most collars are adjustable so you should not have too much of a problem unless your dog is really small or really large. In short, the more levels of stimulation there are, the more control and customization you have to work with your dog. Many shock collars have levels from 1-100, sometimes for each signaling mode. The varying levels of intensity allow you to fine-tune your training. You can see how your dog reacts to a certain level and adjust as needed to ensure the best possible outcome. Ideally, you should purchase a collar that offers as much coverage as possible. Many collars extend to ranges upwards of 500 yards. Indeed, most of the ones in this list extend between 300 and 500 yards. The terrain where you’re training your dog matters as well. If you plan to train your dog in a hilly or area with rough terrain, you might need to get something with more range than your average shock collar. 1. Are shock collars safe for my dog? If used properly, shock collars can be safe for use with dogs when used on vibration or beep modes. As mentioned above, the shock setting should only be used as a last resort or in emergencies and never on the highest setting. In this case, an electric current is still touching your dog, and the lightest amount possible should be used to ensure your dog remains safe. 2. Can I use a shock collar on my puppy? Yes, most shock collars will fit around a puppy’s neck. Some collars can fit neck sizes as small as 7 inches. In this article, we discussed the pros and cons of shock collars and offered our insights on some of the best shock collars on the market today. It’s important to note that shock collars are not universal. Some are used for training a dog, some are used specifically to work with barking, and others work with wireless fences. You should try to find something that works with the behavior you’re trying to eliminate. Overall, we recommend buying a shock collar when other methods of training do not work or if you’re looking to address a behavioral concern quickly. Using the information covered in this article, we have no doubt you’ll find something that will work for you!